23-06-2016. Picture Michael Gillen. FALKIRK. Falkirk Stadium. Falkirk FC return to pre-season training. For season 2016 - 2017. Myles Hippolyte 11, midfielder and James Craigen 28, midfielder. He took in three matches at this summer’s European Championships, including his native England, and had a day out at Wimbledon too. With an eye for the big occasion James Craigen obviously knows a thing or two about the sports business, and he has the degree to prove it! The 25-year-old completed a degree at Edinburgh University while playign at Partick Thistle in Sports and Business management, so when Falkirk’s commercial department needs a hand, they have help just across the corridor. But since then he’s moved into the SPFL Premiership with the Jags – clinched at The Falkirk Stadium – and spent a year in Kirkcaldy at Raith Rovers before his pre-contract move to the Bairns. “Everyone asks me about my degree and if I plan to use it after my career but I have a few more years to think about that yet, I’m still only 25 and I’m just focussed on playing football right now. It’s nice to have that in the bank just incase I need it, you never know. “I never expected to have a football career in Scotland with three clubs when I was a trainee at Preston, but I’m settled in Edinburgh now, and can – at last – understand what everyone is saying!” Craigen is in relaxed mood when he meets The Falkirk Herald for the Game On feature and seems at home already at Westfield. Knowing the players around him has helped. “I knew Aero, Peter Grant, Kerrzo, Bairdy, Paul Watson so a few of the lads, which is always nice coming into a new club. Not walking itno the changing room not knowing anyone. “I know Aero from Partick and Peter Grant through some mutual friends at partick, we’ve met up when on holiday in the past as well. But it’s not just the people who bring the good memories for the midfielder, he’s had some good times on the Bairnabeu too, and he wants that to continue. Last season he converted a freak goal in the icy meeting between Raith and Falkirk, when Blair Alston’s clearance struck Craigen and skided past Danny Rogers. That came after the highlight of his football career with Partick Thistle’s promotion clinched at Westfield infront of a packed and over-flowing away end. “I’ve had a great experience out on the Falkirk Stadium pitch, what three years ago now and hopefully there will be similar with Falkirk in the home dressing room this season! When I remember that day at the stadium, the party, I remember the manager telling us to savour it, to enjoy it because those days don’t come around very often in football and when you’re 21 and you’ve won it in your first season you shrug it off and think it will come again, but looking back on it now he was right. Hoepfully we give it a go this season and I can sample it again. Craigen hit a double against Shelbourne too, including a ferocious volley in the friendly that rounded off Falkirk’s Irish training camp.The games against Bray Wanderers and Shelbourne were Craigen’s first since playing AGAINST Falkirk in the play-offs last season. In a bizarre twist of fate Craigen signed a pre-contract with Peter Houston in the winter, then ended up blocking the Bairns’ path to the Premiership. There was banter in the tunnel at Starks Park, but no question of where the midfielder’s allegiance lay on the park. He knows too then what it is like on the other side of the fence. 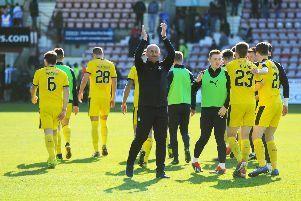 “When you’re coming to Falkirk to play you always think it’ll be a tough game, Raith last year we knew we were in for a game and it was pretty close and when you come to this ground and leave with a point, you think you have gained something. “I’m sure that’ll be the same this year. “It’s going to be a tough league this season, with a lot of good teams in it, but it’s also wide open. For the Falkirk faithful, that would be the business.